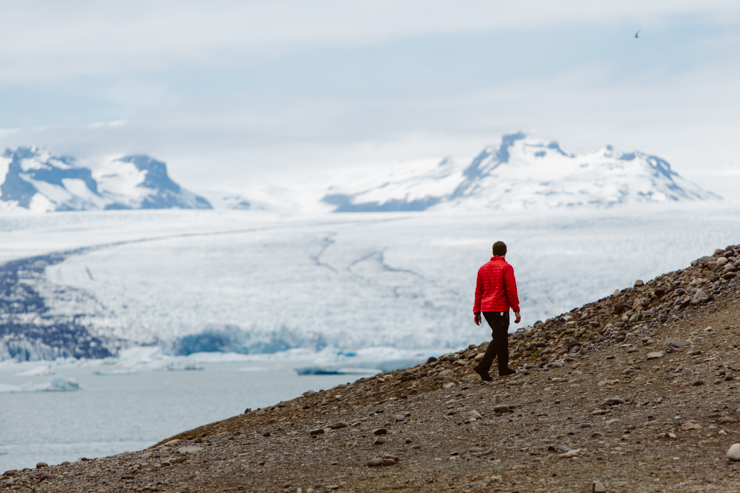 We camped overnight near the Skaftafell visitor center at the foot of the Vatnajökull glacier, the largest and most voluminous ice cap in Iceland. You could feel the cold air flowing off the glacier tongue, but thankfully our sleeping bags kept us toasty! Our plan for the morning was to hike to Svartifoss, a waterfall unique for the basalt columns over which it flows. Of course, it was drizzling and foggy, but we started the hike anyway, loaded with enough photo gear to tire a pack mule. We finally made it to the falls, which were indeed magnificent despite the rain. We explored the area for a short time before heading back. Not long into the return journey, the rain cleared and we were greeted by blue skies. Finally. After some lunch and taking advantage of the nicest shower facilities we had seen in days, we started toward our next destination. 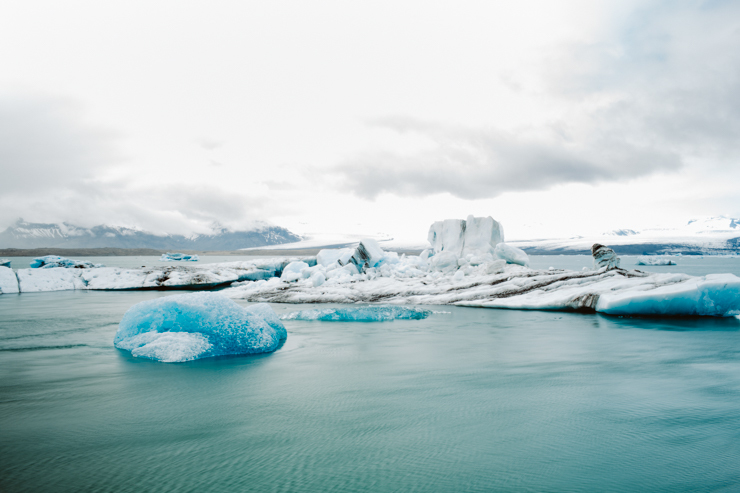 The Jökulsárlón glacier lagoon is one of those places everyone pictures when they think of Iceland, and for good reason. The crystal clear and aquamarine icebergs floating in a glistening glacier lagoon make for outrageously beautiful photographs. We arrived in time to book the last boat tour onto the lagoon. With a little time to kill before our ride, we explored the area surrounding the lake. Soon it was our time, and we excitedly boarded the boat with the other travelers. 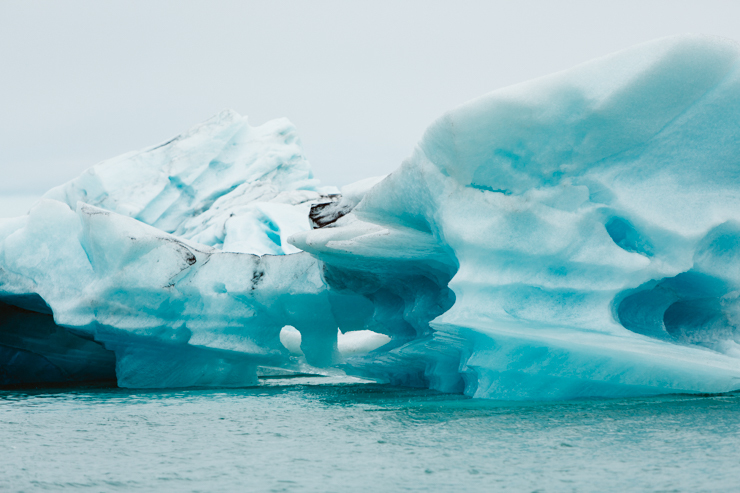 Seeing the ice from shore is amazing enough, but floating by within arm-length is truly magnificent. We also got an informative talk about the geology and formation of the glacier, and got to sample some 1,000 year old ice plucked straight from the lagoon. 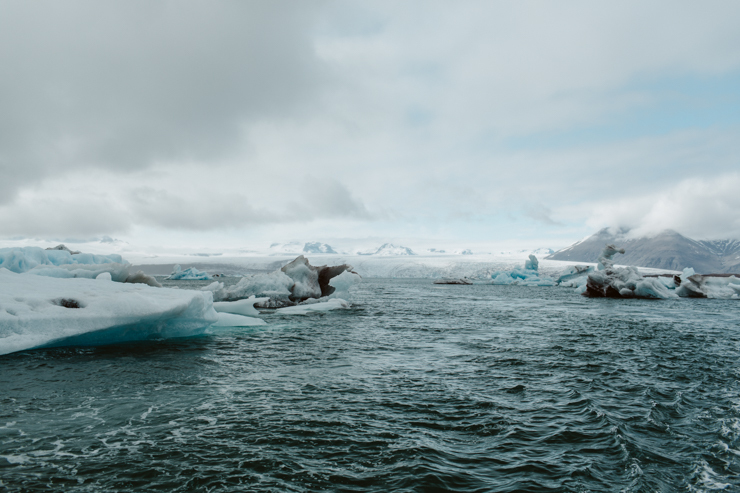 After returning to shore, we grabbed some coffee and backtracked a bit to the lesser known, but equally beautiful Fjallsárlón glacier lagoon. Due to its less famous status, we were the only ones there, save for an older couple who turned out to be from the Boston area. They regaled us with stories of all their adventures to many different continents and countries. Our list of future destinations grew significantly longer thanks to them (Patagonia, we’re coming for ya). After some chatting and photographing, we decided to head north to the coastal town of Hofn, where we would eat and stay for the night. The evening drive to Hofn was quite beautiful as we passed an old abandoned house and fields full of wild reindeer! 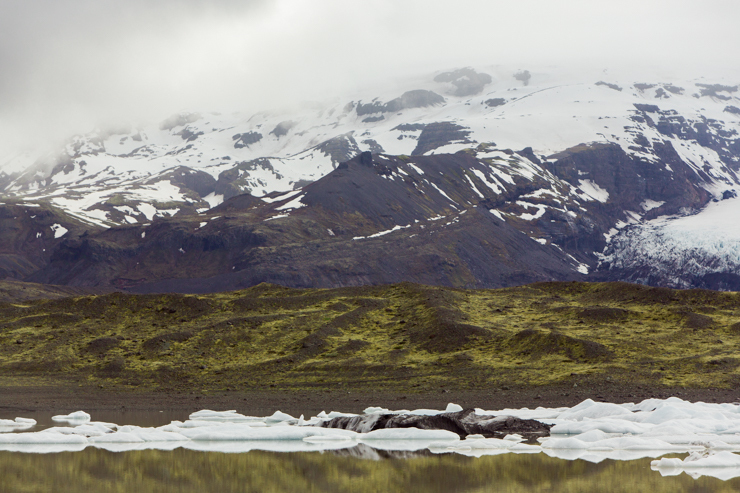 One thing is for sure, the driving is never dull in Iceland, as you never know what surprises you'll come upon next. 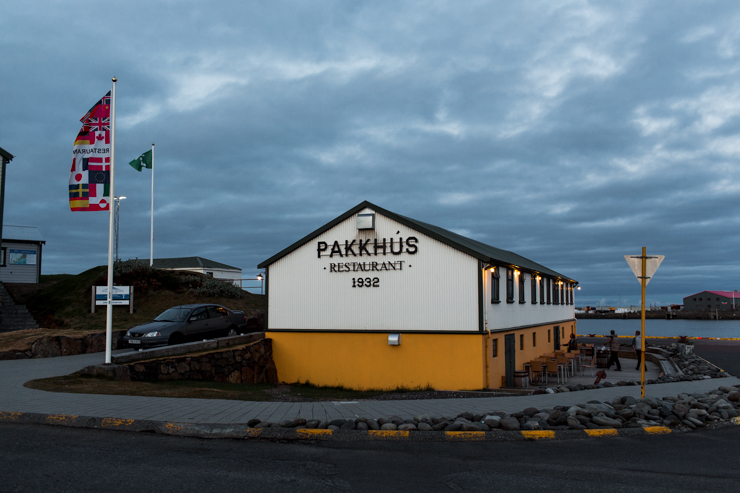 Hofn is legendary in Iceland as the lobster capital of the country. Technically “langoustine” or Icelandic lobster. There were a few places in the running for dinner, but we settled on Pakkhus. A delicious decision indeed. We shared courses of smoked salmon, sheep tenderloin, delightful seasonal veggies, and of course, lots of langoustine. After the last few days of camp stove cooking, we felt like royalty. It was an added bonus to look out the window of the restaurant and see the very boat they use to catch their seafood each day. Following dinner we took a stroll along the water, and were caught up by a group of high school aged locals on a scavenger hunt. They needed a photo of one of their group holding a tourist. We were all too happy to oblige. It was an awkward and hilarious moment proving laughter and silliness know no language barriers. This morning we walked for hours on planet Mars. Just kidding, but that's what it felt like. 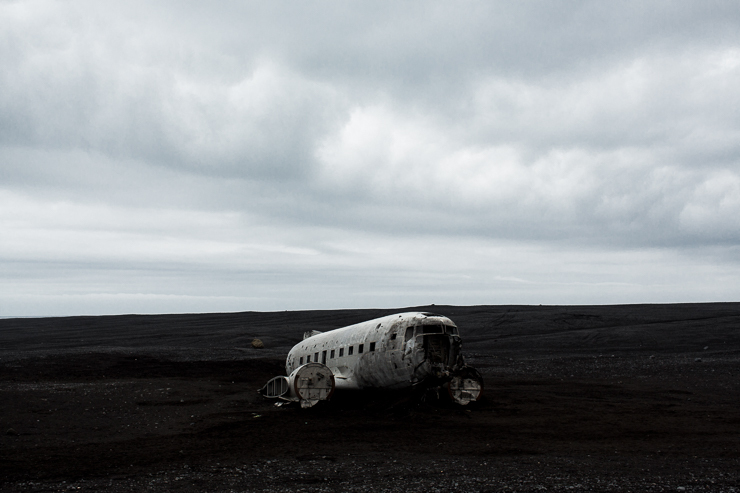 We were the only people walking the approximately 4km on the Sólheimasandur black beach to see the famous crashed US Navy DC-3 plane (for the second time, might I add). 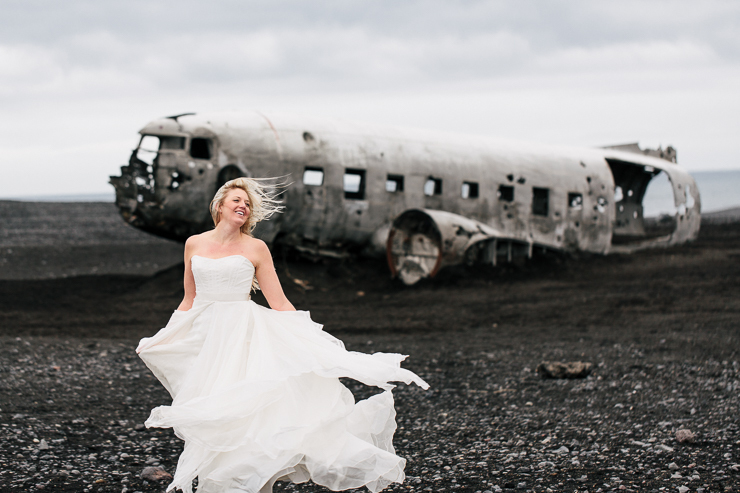 Even without the mysterious and eerily wrecked DC-3 plane as our goal, the walk out to the ocean along the miles and miles of black sand is an experience to be had; like living in a black and white photograph. Perfectly level black sand stretched along the line of the horizon, solitary. The emptiness, the perfection and rawness of nature, the absence of humanity, and the presence of God in a place so foreign to my eyes is something I'll never forget. For a brief moment, I felt like Ben and I were the only people left on earth and it was both terrifying and magical all at once. Seeing nature in its completely untouched form is especially beautiful. My hope is that visitors to Iceland are careful to preserve and realize the privilege to visit a place so untouched and remarkable. Once at the plane, we took some photos I have been dreaming about for a long time. 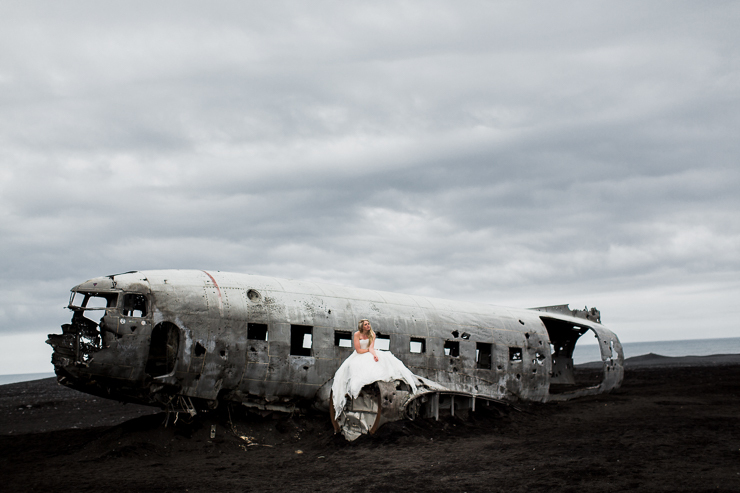 Something about this wrecked plane, abandoned and surrounded by miles of unobstructed land, mirrors the way I feel about life; alluring, mysterious, messy, fractured, photogenic, unusual, and magnetic. Seeing the plane in real life has been a dream of mine, and it definitely didn't disappoint. 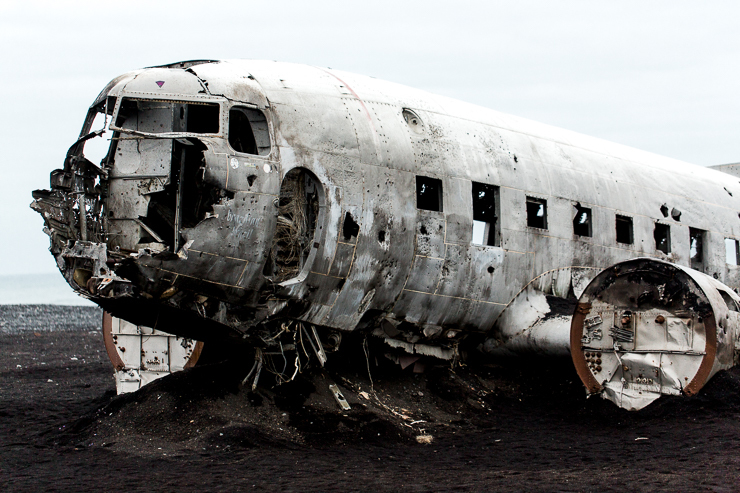 On November 24, 1973, a US Navy DC-3 plane was forced to make an emergency landing on the Sólheimasandur beach in the south of Iceland. While no one is exactly sure of why the plane went down, the suspected cause was due to an empty fuel tank. 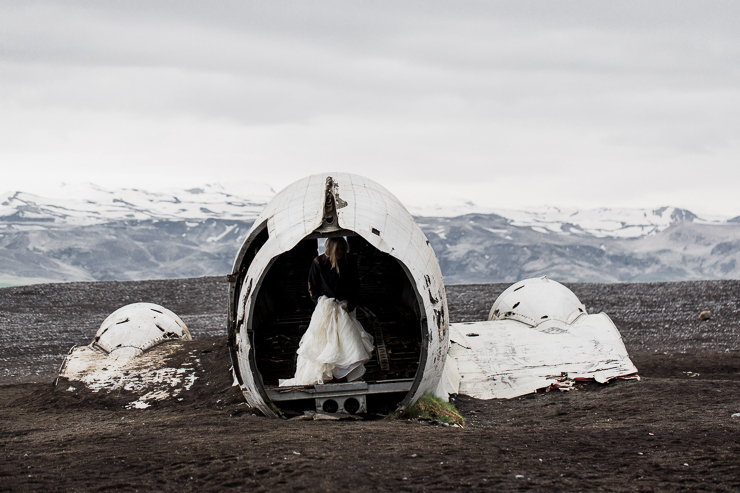 All of the crew members survived the crash and the plane was left abandoned on the desolate beach. 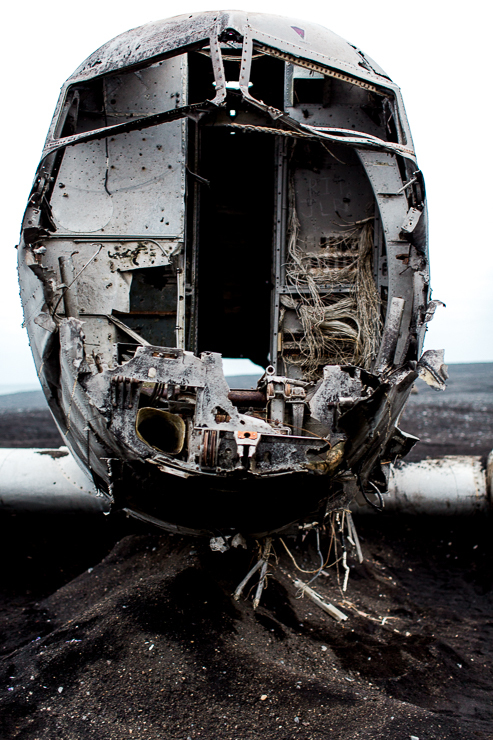 How do you find the wrecked DC-3 plane? 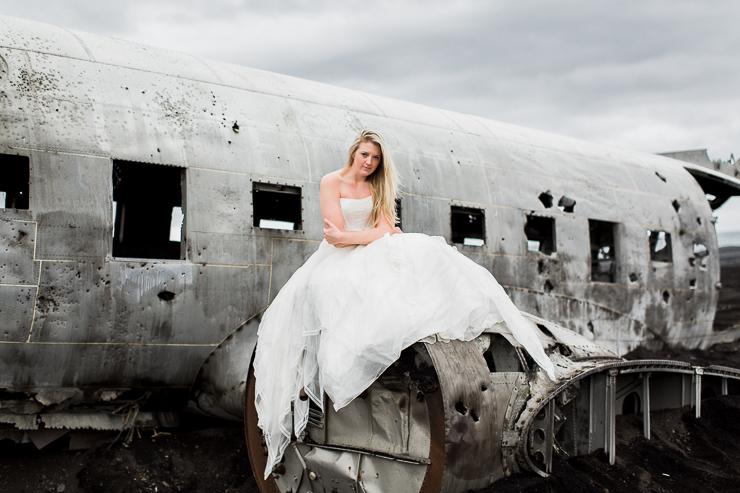 The wreckage is located on the South coast of Iceland heading East (counterclockwise around the ring road). 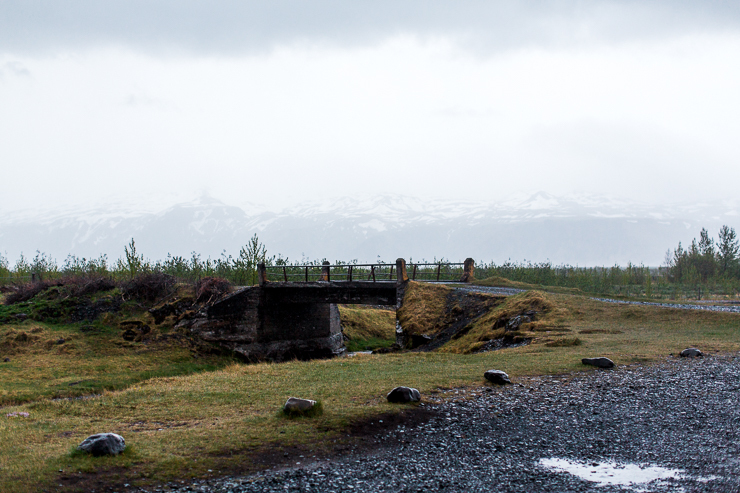 After driving past Skógafoss, heading East on Rt 1, you'll cross a bridge with blinking yellow lights. Once past the bridge, keep your eyes open for a dirt road turnoff with an open gate at the bottom about 2 km past the bridge (on the right side of the road). There are usually cars parked there (it's a popular destination, so you shouldn't miss it!). If you've passed the second bridge you've gone too far. The walk from the parking area takes about an hour 1/2, but it's quite an easy hike. Make sure you have comfortable hiking boots because the ground is pretty rocky! Everyone keeps asking "is the plane is still open to visitors?". The answer is YES! The plane is located on private property so be respectful of the land and the plane. Visitors were driving off road and leaving the area a mess, so the owners closed the road to the wrecked plane. Justin Bieber also recently filmed a music video where he is seen skateboarding on top of the wrecked plane (a sign is still staked in the ground near the plane mentioning his video is in the process of being made -- it's not, obviously, as it's already been released). The landowners have banned access to vehicles driving on the beach but you can still walk the 4km to the plane from the road (approx 8 km round trip). It's definitely worth the walk to see in real life. If you plan on visiting, please be respectful of the property and the plane. 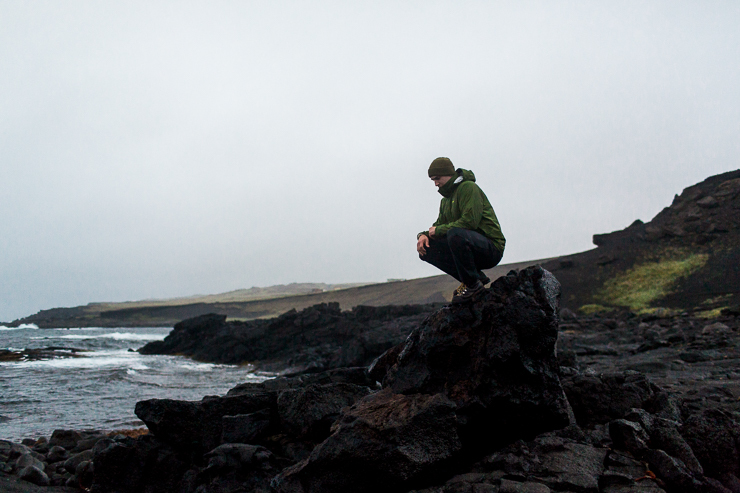 Following our early morning escapades to the plane wreckage, we headed on to a new adventure, a small peninsula, Dyrhólaey. The drive up the top of the hill to see the lighthouse, Dyrhólaeyjarviti, constructed in 1910 was interesting. Probably best if you have a 4x4 vehicle as the hill to get to the top is pretty rugged with lots of big holes. Once at the top, there is a stunning view of the ocean, black beach, and land surrounding the peninsula. Our next stop was the cute little town of Vik, the southernmost village in Icleand. We stopped and saw the infamous church on a hill (although, I'm quite positive you see this exact same style church about 50+ more times during your drive around the ring road). haha. It does sit beautifully atop a hill in Vik surrounded by fields of vibrant Alaskan lupine. The purple flowers were introduced to Iceland in 1945 as a way to add nitrogen to the soil and to serve as an anchor for organic matter, but has flourished and become invasive. One of the Icelandic natives told us although quite beautiful, the lupine have taken over a lot of the land where blueberry fields used to be rich in fruit. Spreading like wildfire, these plants have also invaded areas where low-growing mosses have formed over many years and are unfortunately killing other native plants. Species diversity among plants has decreased since the introduction of these plants. After reaching Vik, we turned back and headed to the famous black sand beach under the Reynisfjall mountain, Reynisfjara. This beach is the only black beach I had ever heard about in Iceland, not realizing that almost all of the beaches in Iceland are black. 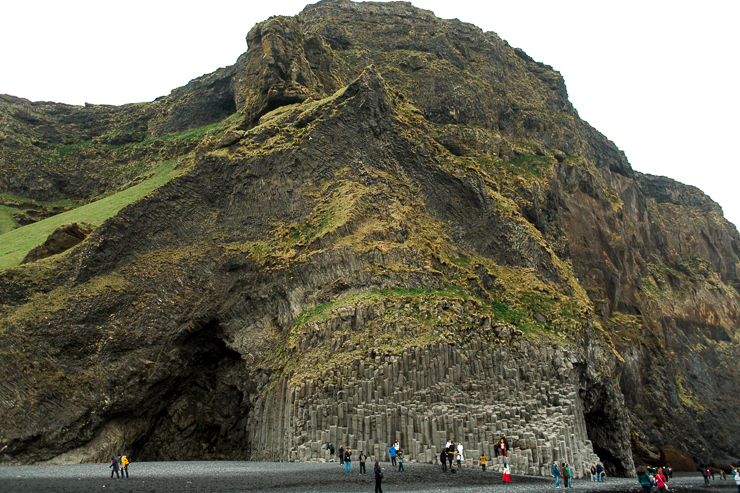 This beach is famous for the basalt columns, caves along the beach, and cold and dangerously unpredictable waves. When the tide is in you can actually become trapped in the caves. 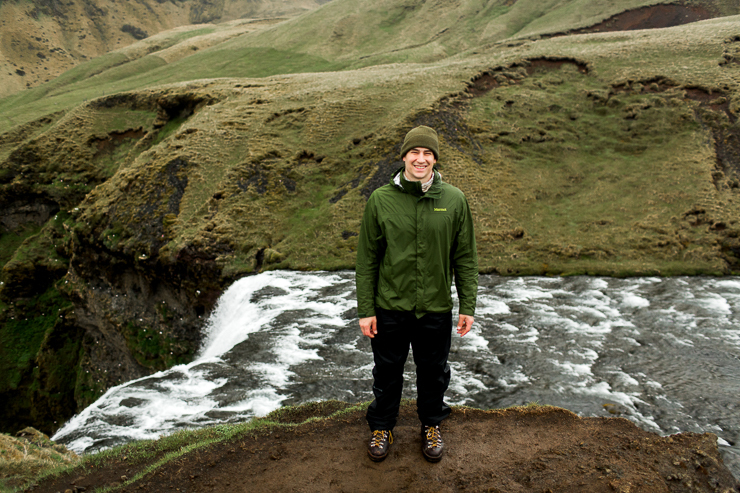 Continuing East past Vik, the black sand and windy rivers, there is a stretch along the road, Þjóðvegur 1, where you're completely surrounded by hills of volcanic rock and moss. There are places where you can pull off and hike down paths and it's incredible. The ground is so soft and spongy. If you're visiting, please do not ever walk or run on the moss. There are special paths already made, stay on them!!!! Iceland's fragile nature needs preserving and the moss can be easily damaged and potentially irreparable. Follow the mantra 'leave no trace'!!!!!! Take only pictures and memories and be considerate of other visitors...protect the quality of their experience. If today had a theme it would be "Waterfalls". Lots of waterfalls. 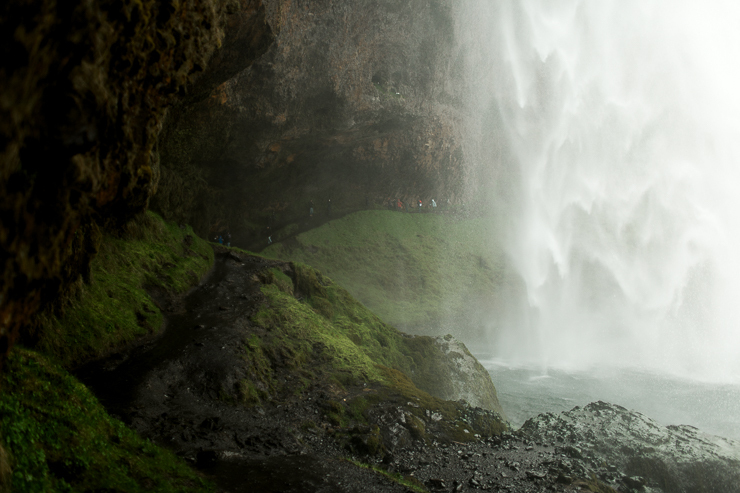 First up was Seljalandsfoss (the 'ja' pronounced like a soft 'yuh'), a well known tourist stop where you can walk behind the massive wall of cascading water and get soaked in the mist. After that was a short drive up the road to Gljufrafoss. It was raining pretty hard and quite windy so we decided to cook lunch and coffee inside an old little barn while we waited for the weather to improve. Gljufrafoss didn't look like much from a distance, with most of the water falling and hiding behind a rock face. Upon getting closer, we spotted a climbing route up the face which yielded a stunning view of the full waterfall splashing into a hidden area below. We climbed back down and entered the lower area through a narrow fissure in the rocks, walking to where the water crashed down from above. On the road again we passed a good view of the volcano Eyjafjallajokull that was responsible for the recent massive eruptions in 2010 that affected air travel in Europe and elsewhere with the ash cloud. Our next stop was something we had been looking forward to for a while, Seljavallalaug. In a valley several miles off the main road is a geothermal outdoor pool built in 1923. The hike back took about 20 minutes, through unbelievably scenery, surrounded by a valley with over a dozen small waterfalls all traveling downwards to join a small river. Another waterfall? Yep, why not! Skogafoss. It was getting pretty late at night (hard to tell without the sun setting) so we decided to go ahead and hike up 527 steps to view the top of the waterfall (felt like a LOT of steps). The rain was still coming down, but a bit slower at this point which made this waterfall a bit more enjoyable. The view from the bottom was obviously stunning, but I actually preferred the view mid-way up! Our final stop for the day was something we had been looking forward to for a long time. 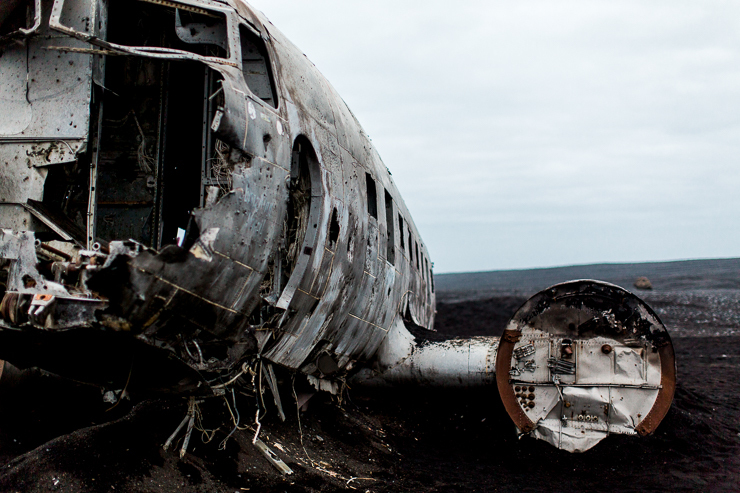 We were headed to find the famous crashed DC-3 plane on the black beach at Solheimasandur. 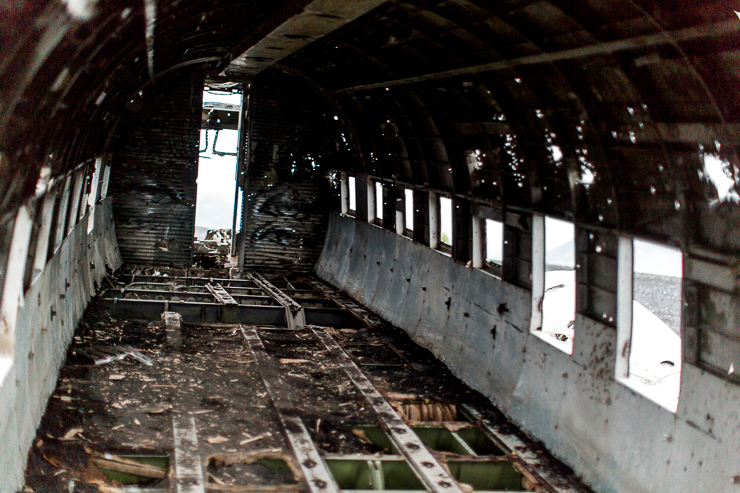 The plane was a US Navy aircraft that ran out of fuel crash landed on the beach in 1973. 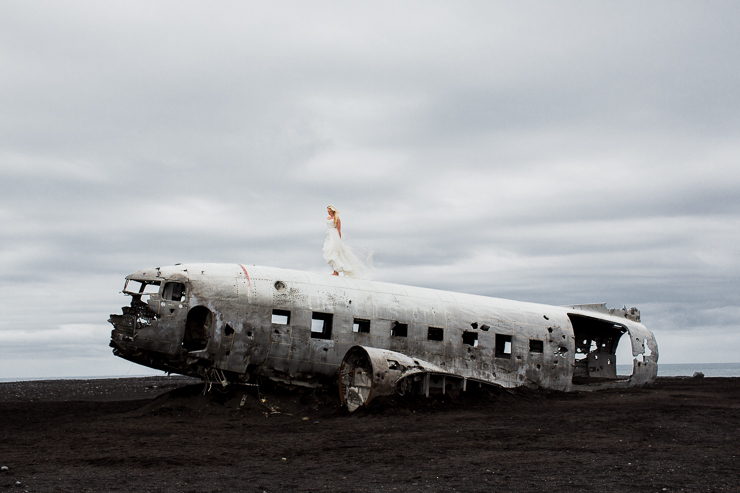 The crew survived but the plane was abandoned and still sits alone on a desolate stretch of the southern coast. Getting to the plane involves finding the turnoff and then walking about 4km to the beach. We arrived fairly late in the day, and began the trek with our photo gear in tow. The walk itself was a unique experience as the path is dead-level and straight into the horizon across a black desert that seems more like an alien planet than Earth. After about an hour we finally arrived. It was such a surreal moment after seeing the plane in so many photos to now be right next to it. After taking plenty of photos, we decided to come back early the next morning to create a certain image I had dreamed about for a long, long time. With that decided, we began the long trek back to the car. 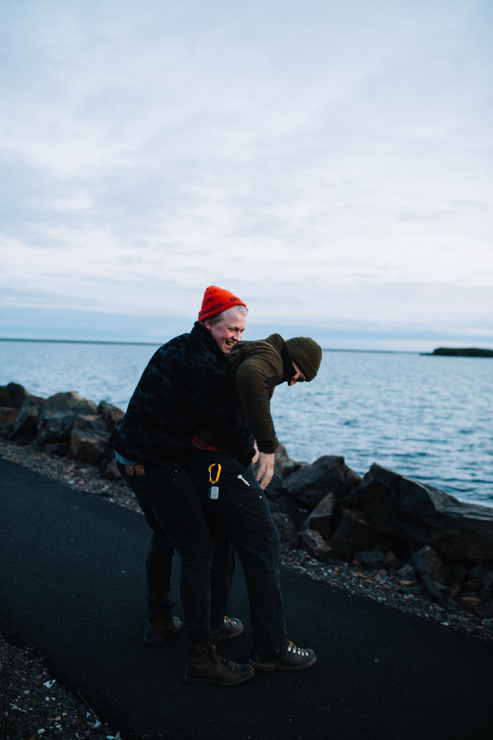 I desperately needed a shower, but the only hiccup was that we forgot to trade in our US dollars for some Icelandic Kronur before hitting the road...therefore leaving me campground-shower-coinless. Ben went into the campground and hustled me three hundred Kronur (about 3 US dollars) from some very kind campers. Although the shower was broken and only the hot water worked (OUCH), I was able to get a 5 minute very-hot-shower. So refreshing! Today we woke up to a large amount of rain and wind! 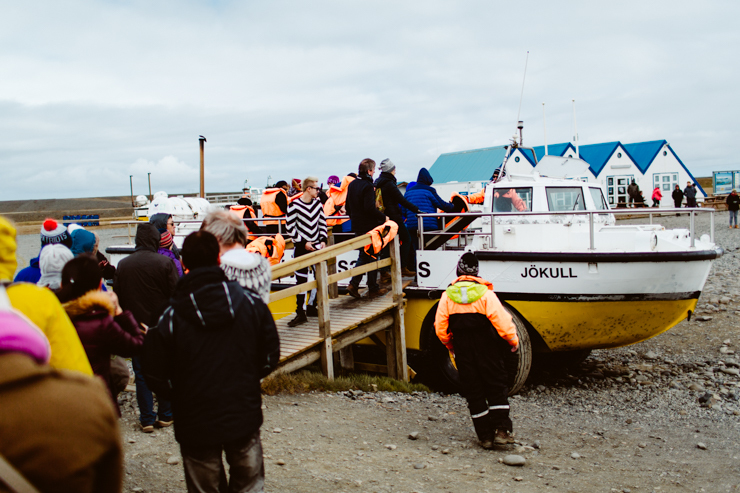 After getting our car put back together (not much fun in the windy rain storm), we headed to Landeyjahofn where we hopped on a ferry boat, Herjolfur, bound for Vestmannaeyjar (also known as the Westman Islands). The ferry ride took approximately 30 minutes and once we arrived, the view of the islands was spectacular. 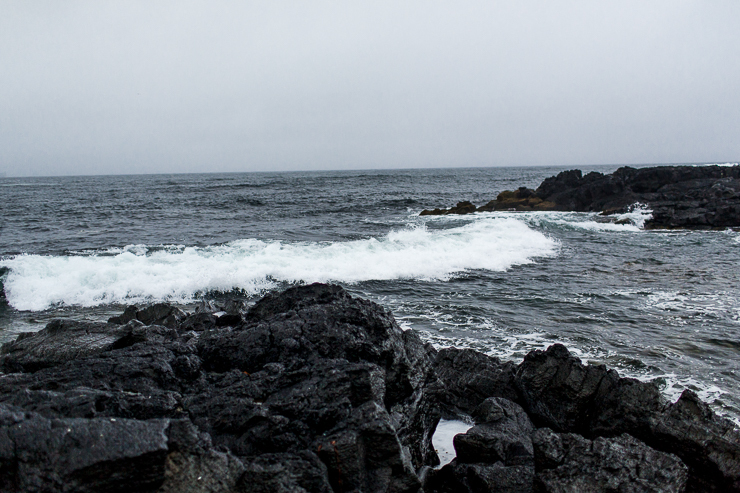 Due to the wind and rain, the islands were covered in a thick, dense fog; nonetheless, captivating. When the boat docked, we could not figure out how to get back down to the section of the boat where our car was housed, so we left the boat. 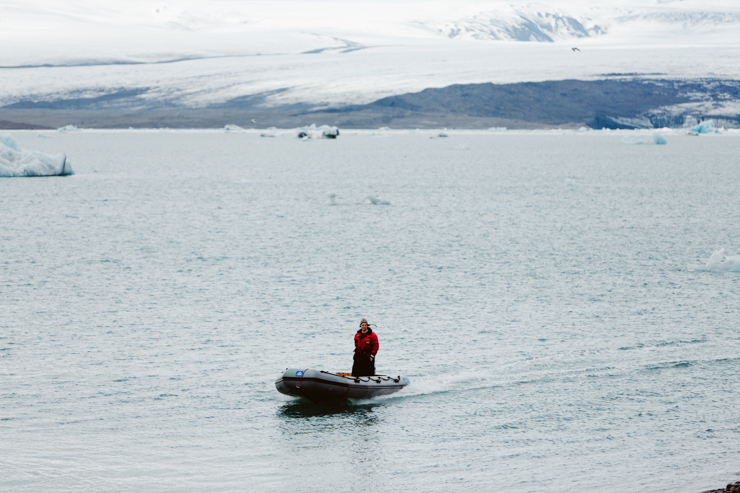 When we realized we had taken the wrong exit, we ran back onto the boat and quickly down to the area with our car. Our car was the last car remaining on the ship, and the ferryman was perturbed and quite nicely told us that we could have been fined 1,000 euros ($1111.10). So...for any of you who plan on taking this little extravaganza to the Westman Islands...make sure you don't slip up! It'll cost ya big bucks. haha. Taking a sigh of relief that we finally were in our car cruising around the islands (without a large fine), we stopped by a few local grocery stores to try and find ice for our cooler. In a country called Iceland, I find it quite ironic that there is a significant lack of ice cubes or any sort of ice. What the heck? By this point, we were hungry, so we pulled off in a little park area with a few Turf Houses and cooked ourselves some tomato soup! Well, actually, Ben cooked the soup in the pouring rain, while I sat in the warm car uploading photos. Sometimes I question why he married me :)...seems like I got the better end of the deal. After a quick bite to eat, we ventured to Saeheimar, an aquarium and natural history museum. We were so focused on getting to hold their rescued Puffin that we didn't even remember to view the aquarium! I could have cared less that anything else existed between those walls...my entire experience was dependent on holding the puffin (which turns out are quite tiny little things). The people working at the museum were so sweet and so patient. The boy in charge of the little puffin let everyone hold him and take turns taking silly photos with him on your head or shoulder. Since we hadn't seen a puffin out in the wild, we headed down to Storhofdi, the southernmost part of the island. From a bird viewing hut we saw a few puffins come out of their homes and even saw a seal swimming down by the caves! Next up was the black beach. I had heard so much about the famous black beach in Vik that I did not really think that any other black beaches existed in Iceland. 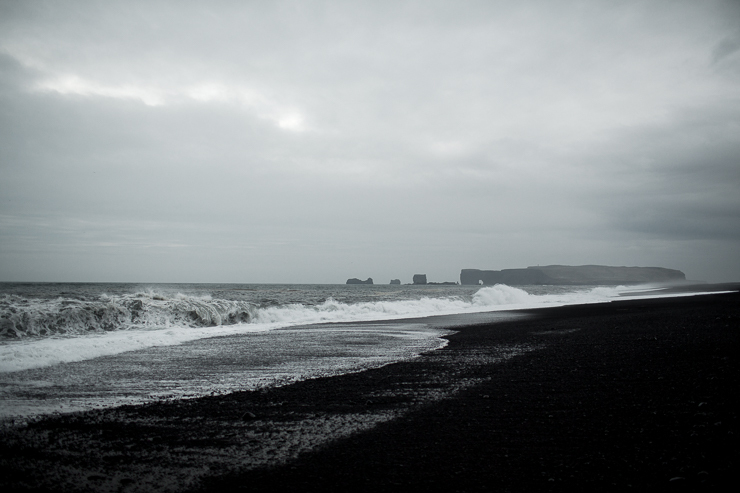 There are actually quite a lot of black beaches all around the southern section of Iceland (and each one equally impressive). There is something about watching the swirling white waves crash into the black beach that you cannot really comprehend; something your eyes take a few minutes to adjust to. It's literally like living in a black and white photograph. Our final adventure of the day was scaling the highest point on the island, Heimaklettur. The climb consisted of almost vertical ladders, ropes, and chains in which you had to use in order to make it to the top. After the ladders, first chain and rope section, I was beyond terrified. I'm definitely not one who is scared of heights, but the climb just seemed incredibly dangerous in the conditions we were facing (fog, high winds, cold rain). About 1/3 of the way up, I realized I had gotten myself into something I was not really expecting. Ben did his best to convince me to push past my anxiety and make it up a bit farther (promising we did not have to make it to the top if I was too scared). Ben has pushed me to do things that are not in my comfort zone before, and I am always so thankful once I have done something I did not think I could possibly do. I decided to push on and climb the rest of the way. After more ropes, more chains, and tiny one-two foot paths up steep inclined cliffs, i made it to the highest point where I found a lone puffin. Looking in all directions, the wind and fog thrashing around me, I realized I would never be able to make it back down. I completely froze and panicked. I sobbed. For about 2-3 minutes, I sat at the top and just sobbed thinking there was no way I could move and climb back down. Ben calmed me down, assured me that if I made it up, I could definitely make it back down (that was the easy part). He was right. Climbing back down felt like a breeze. The relief of knowing I would be back on solid ground without the wind toppling me over each step was enough drive to push forward and make it back down the cliff side. After we got safely back to ground, I was really proud of myself for accomplishing something I never could have done on my own. Later on, we read directly from our Iceland Lonely Planet Travel Guide Book..."Heimaklettur is more perilous, with wild rickety ladders...when its rainy or slick [it is not] a good idea." Too little, too late. The perilous journey had already been done. We had survived. 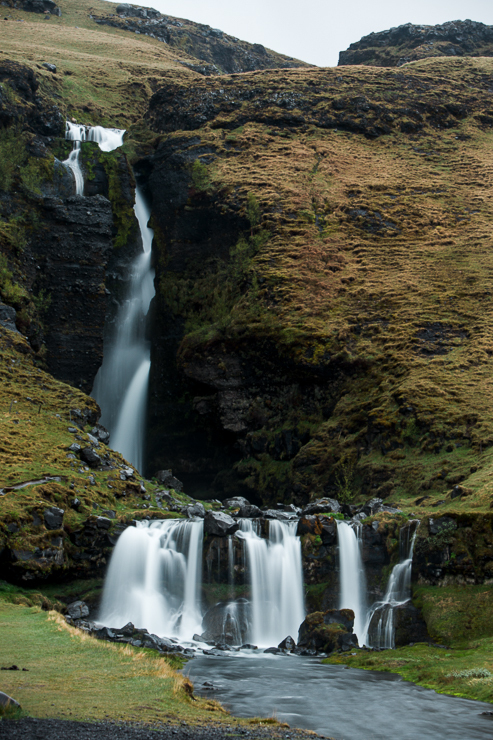 Once we were back to Iceland we meandered over to another waterfall, Gluggafoss. We decided to hang with my brother-in-law, Taylor, via Facetime so that he could hike with us to the waterfall (bros gotta adventure together, duh). There was another little waterfall right beside Gluggafos, which had hundreds of sheep below grazing in a field. One of my absolute favorite things here are the sheep (they're everywhere, and they are so fun to watch frolicking in the fields). It finally stopped pouring rain for a brief moment and we were able to enjoy the overcast skies as we tucked ourselves in to our car-camp. The high winds made rearranging the car incredibly difficult, but it was the first night it's been dark enough to even feel tired at all. Excited for day four adventures!